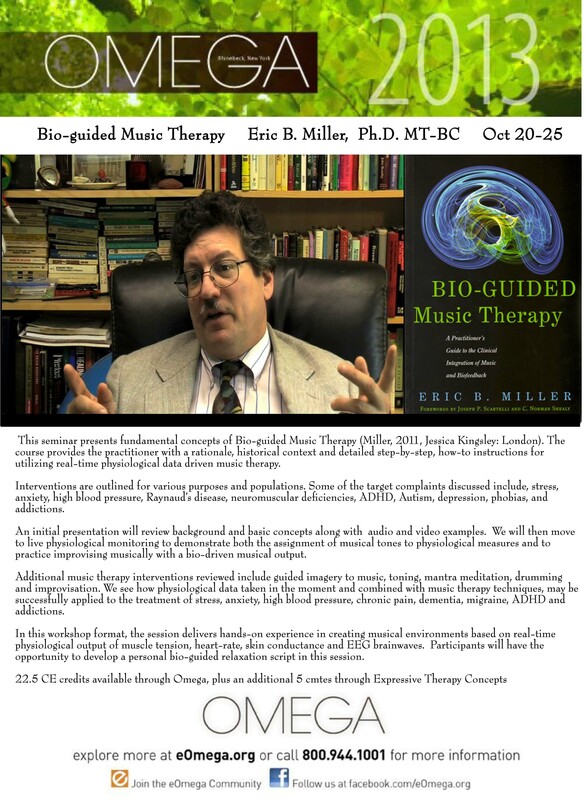 This seminar presents fundamental concepts of Bio-guided Music Therapy (Miller, 2011, Jessica Kingsley: London). The course provides the practitioner with a rationale, historical context and detailed step-by-step, how-to instructions for utilizing real-time physiological data driven music therapy. Interventions are outlined for various purposes and populations. Some of the target complaints discussed include, stress, anxiety, high blood pressure, Raynaud’s disease, neuromuscular deficiencies, ADHD, Autism, depression, phobias, and addictions. An initial presentation will review background and basic concepts along with audio and video examples. We will then move to live physiological monitoring to demonstrate both the assignment of musical tones to physiological measures and to practice improvising musically with a bio-driven musical output. Additional music therapy interventions reviewed include guided imagery to music, toning, mantra meditation, drumming and improvisation. We see how physiological data taken in the moment and combined with music therapy techniques, may be successfully applied to the treatment of stress, anxiety, high blood pressure, chronic pain, dementia, migraine, ADHD and addictions. In this workshop format, the session delivers hands-on experience in creating musical environments based on real-time physiological output of muscle tension, heart-rate, skin conductance and EEG brainwaves. Participants will have the opportunity to develop a personal bio-guided relaxation script in this session.